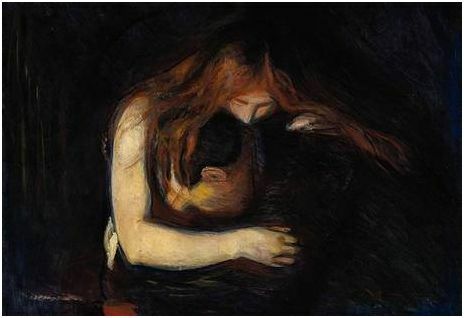 One of the most sensational and shocking images in European art, Edvard Munch’s painting of a man locked in a vampire’s tortured embrace – her molten-red hair running along his soft bare skin – created an instant outcry when unveiled a century ago. Some believed the Norwegian artist’s anguished 1894 masterpiece, Love and Pain – since known as Vampire – to be a reference to his illicit visits to prostitutes; others interpreted it as a macabre fantasy about the death of his favourite sister. Some years later, Nazi Germany condemned it as morally “degenerate”. Vampire has become one of Munch’s most sought-after and reproduced images, despite remaining in the hands of a private collector for the past 70 years. The painting will go on the open market, The Independent can reveal, and is anticipated to smash the $31m (£17m) auction record for a Munch work. Vampire, which is often seen as the sister of The Scream, completed just months earlier, will be sold at a Sotheby’s auction in New York for an estimated $35m. The painting was part of Munch’s seminal 20-work series The Frieze of Life, which included The Scream. It is the most significant version of four Vampires he completed in 1893 and 1894, and was first exhibited in 1902 in Berlin, where his works caused shock and awe. Vampire caused a sensation when it was unveiled, touching on turn-of-the-century fears about women’s liberation. Some critics were outraged by its perverse, almost sado-masochistic depiction of passion. Mr Shaw added: “It was shocking to Berlin society just as it is shocking today.” Munch, however, always insisted it was nothing more than “just a woman kissing a man on the neck”. The work also became the basis for several pastels, woodcuts, lithographs and prints, one of which will be sold at Sotheby’s in London on 2 October, entitled Vampire II and estimated to fetch up to £400,000. The painting will be on view in London from 3 to 7 October, and then in Moscow, before it is sold in New York on 3 November. "[Vampire] fetched 38.2 million dollars (£24.3m), including the buyer's premium, and broke the existing Munch record of 30.8 million dollars (£19.6m)..."